No Credit Check on 3 Pay Plan! The guitar is the iconic symbol of modern music; the epitome of ultra-cool. Picture Jimi Hendrix playing his Fender Stratocaster, Jimmy Page with his low-slung Gibson Les Paul, or Steve Vai and his Ibanez Electric Guitars – the Signature Jem 777. Three different types of guitars, each providing its player with a very different sound, inspiration, and style. Across the globe, the guitar can be found in almost every type of music, from classical to metal. Whether your ambition is to play concerts, clubs, at church, or just your living room, the guitar affords you the flexibility to accomplish it all. If you’ve been playing a while, you’ll be able to easily find what you’re looking for within these pages but, with such a huge selection of guitars available, choosing your first instrument may seem like a daunting task. Fear not and allow us to provide a little guidance. For a beginner, deciding whether to start on acoustic guitar or electric guitar is a common dilemma. Do you start on acoustic and work your way up to electric? Are acoustic guitars less expensive? What are the advantages of each? When choosing between acoustic guitar and electric guitar, don’t make your decision thinking one type is considered a starter instrument. There are great playing and well-made instruments available in either style with models in absolutely every price range, including those for the budget conscious. The determining factor in deciding between an acoustic and electric guitar is the style of music you wish to play. If you’d like to do the singer/songwriter thing, a la Jason Mraz or James Taylor, an acoustic guitar would fit the bill. If you are more the type to head bang to Metallica, then an electric guitar with some raucous distortion would get you where you want to be. Matching the type of music you would like to play with the style of guitar is key. Electric guitars come in varying body styles. Most guitars have at least a single cutaway where the body is “cut away” allowing access to the upper frets, beyond where the neck joins the body. Examples of this include Gibson Les Paul Guitars and Fender Telecasters. Other body styles like the Fender Stratocaster and Gibson SG have what’s known as a “double cutaway”, where there is extended access on either side of the neck. You’ll find electric guitars available as solid body, hollow body (a top, back and sides with an acoustic chamber and possibly violin style “f” holes), or semi hollow (hollow, but with a block of wood usually running down the center of the body.) The thickness of hollow and semi hollow bodies also varies, with the thicker bodies usually used for Jazz. There are also baritone guitars that have a larger body and longer scale that can be tuned to a lower pitch. Acoustic guitar shapes are available in many styles with or without a cutaway. Without one, the body and neck usually join at the 12th or 14th fret and access above that can be somewhat limited. The dreadnought, pioneered by C.F. Martin, is what you probably picture when you think of an acoustic guitar. It is by far the most popular and widely used body style. On either end of the scale you’ll find the smallest, full-size body being the parlour guitar and the largest the jumbo. Most classical guitars are the same shape with the main difference being the addition of a cutaway. The species of wood used to construct the instrument plays a big part in its tone. You’ll find guitars made of Rosewood (balanced and loud), Mahogany (warm and mellow), Maple (bright and clear), and Koa (warm with a bright top). Acoustic guitar tops are often spruce or cedar. Six, right? Not so fast. Though the vast majority of guitars have six strings, you do have options. Twelve string guitars have six pairs of strings, with four of the six tuned in octaves and two in unison. Played like a six string, a twelve string provides a thicker, fuller sound similar to that of two guitarists playing together. Twelve string guitars are available in acoustic and electric versions. Seven string electric guitars and eight string electric guitars are also an option, although they are not usually chosen by beginners. These instruments allow the player to reach deeper into the bass guitar domain. What if I Want it Loud? While electric guitars obviously plug into amplifiers, some acoustic guitars may also include a magnetic or piezo pickup allowing them to be plugged in. Acoustic Electric Guitars are available in many of the popular shapes. As personal as each player’s choice of instrument is, their amplifier holds an equal level of importance. Just as guitars all have their own unique tone, guitar amps tailor that tone to suit the individual’s taste. Maybe it’s the searing crunch of a Marshall or the bell-like tones of a Fender guitar amp that suit your needs. It’s possible the variety of sounds a modeling amp affords would be more appropriate. The genre of music combined with the type of performances you plan to do play a big part in your decision. Guitar Effects are really where the vista truly opens wide! Placing one or more effect pedals between your guitar and amplifier can dramatically change your tonal landscape. Distortion, fuzz, and overdrive can all add a level of dirt and grime to your sound. Modulating your sound via, chorus, flanger, or pitch change pedals can add doubled notes that have their pitch or tone altered to sweeten, fatten or even make it sound like there’s more than one person playing. There are EQ’s, loopers, boost pedals … the list goes on. Combining any number of these provides you with an endless variety of tone. 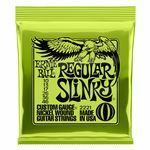 There is a wide variety of guitar strings, with electric, acoustic and classical guitars all using different, non-interchangeable strings. Electric guitars are usually strung with Nickel or Stainless Steel wrapped around a steel core. Acoustic strings have Bronze or Brass wrapped around a Steel core and nylon strings have Silver and Nylon wrapped around a Nylon core. The Nylon strings have a much softer and smoother feel than the other strings and produce a mellower sound suitable for Classical or Flamenco music. Find an instrument that speaks to you, one that suits the kind of music you want to make and start having fun, making money, or both!